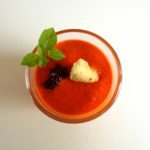 This little gem of a recipe for chilled red pepper soup was inspired by a recent visit to one of my favorite Paris restaurants, Zebulon, where it was served as a surprise “palate teaser”, with a tiny savory biscuit and finely chopped black olives on top. There were only a few spoonfuls in the tiny soup cups, but — wow — did they pack a punch. The flavor is reminiscent of gazpacho, but more sophisticated. When I got home, I had to try to make it. In cases like this, I sometimes ask the restaurant for the recipe, but this time I did not, perhaps intimidated by the star power of Takashi Aoki, Zebulon’s fantastically talented and creative new chef. I decided instead to experiment. I began by roasting red bell peppers until the skin charred and they were tender. I peeled and seeded them and popped them into the blender, along with olive oil, red wine vinegar and a little salt. That was it for the first experiment, which we polished off at home in a trice. The second time, I stirred in a little cream at the end to lighten the flavor, which had felt a bit too pungent the first time around. I served the soup to a discriminating panel of guests — three top-flight journalists and an ambassador — who proved to be wildly enthusiastic. So whether it is an exact replica or not, it seems to be a perfect summer starter. The key is to serve very small portions to avoid overwhelming the meal. What else is on the mind-bogglingly creative menu at Zebulon? As a starter I chose grilled green asparagus with sautéed langoustines (aka scampi), a grapefruit emulsion (foam) and cardamom-flavored crumble, all tiny but incredibly delicious. My main course was red mullet filets with small artichokes (poivrade), a purée of finocchio and green olives, and sauce diable. And for dessert, a mango mousse with mungo bean tapioca, lemongrass and hibiscus sorbet. Superb. I doubt that I’ll be attempting to replicate these other dishes anytime soon, as they rise too far above my everyday style of cooking. But if you happen to be in Paris, give Zebulon a try. The three-course dinner menu is reasonably priced at 45 euros. It is, simply put, a treat. This entry was posted in 2. Soups and tagged biscuits salés aux herbes de Provence, creme de poivrons rouges, recette, recipe, red pepper soup, savory herbal biscuits, takashi aoki, vegan, zebulon. Bookmark the permalink.